Microgaming welcomes you the mountains of central Asia, where a brand-new group of pandas are having a tremendous fruit party! This is yet another panda-themed game, but the world definitely needs more and more pandas, because these cute and cuddly creatures are so easy on the eyes. 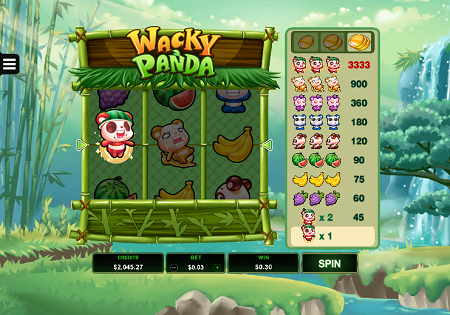 Wacky Panda is a classic fruit machine, offering three reels and a single payline players can benefit from. Like plenty of other old-school slots, the Microgaming title does not offer any special features, but it does offer you a chance to play with five adorable bamboo lovers, which represent high-value symbols. Also, spinners will have the chance to win up to mouthwatering 3,333 times the bet. Once you start the 2017 release, you will find yourselves on a breathtaking glade, just next to a sparkling waterfall and a beautiful lake. This is where five little pandas are having their party and playing with their fruits. The Reddish Panda is running around with a watermelon helmet on his head. The lazy Yellow Panda is crying on a pile of bananas. The Purplish Panda is wearing a grape on his forehead and the Blue Panda is practicing his yoga. As for the Brownish Panda, he is just sitting there, with his tongue out. All five pandas are done like emoji and all five of them represent high-paying symbols. As for the Watermelon, Bananas and Grapes, they serve as low-value symbols. Since we are talking about a classic fruit machine, it is obvious that there are no complicated features and plenty of options gamers can use. It all comes down to simply spinning the reels, waiting for big wins. Wacky Panda features a 3×3 grid and players can benefit from a single payline. Winning payouts is rather simple, since the goal is to land three matching symbols on a payline. Punters can alter the coin denomination and the number of coins they want to place on a payline. Bet 1, 2 or 3 coins and set the coin value somewhere between £0.01 and £5. The lowest you can wager is £0.01, while the maximum bet is set at £15. We recommend that you place the maximum number of coins, because it will secure you bigger payouts. As for the command list, players can use the Spin button, Bet option, Coins option and Settings, where they can speed up the reels a bit. This is the section where we usually talk about free spins and additional Bonus features, but, since this is an old-school video slot, there are no special features whatsoever. No Scatters, no Wilds to benefit from, but there is one thing we could mention – the Reddish Panda with a watermelon helmet on his head. This symbol is very important, because this is the only symbol that will pay even if you land one or two of them on the payline. Every time he appears on the payline, he will start jumping around and reward spinners with a corresponding payout. Place a maximum number of coins and land all three Reddish Pandas on the payline and you can win 3,333 times the bet. Since there is only one payline, it will not be easy to land winning combinations on regular basis. Fortunately for all gamers, the Reddish Panda will pay every time he appears on the payline. As we already mentioned, the Reddish Panda will get you 3,333 times the bet if you bet to the max, so punters can win up to £49,995. Other pandas pay less. 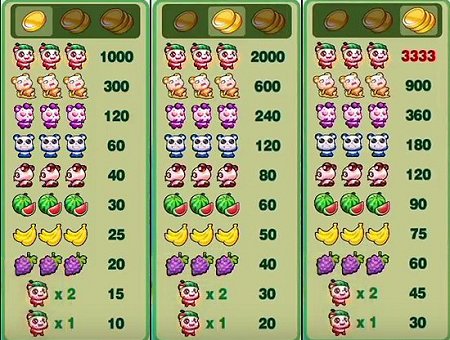 For example, the Yellow Panda offers up to 900 times the bet, while three Purple Pandas can pay you up to 360 times the bet. Wacky Panda is playable across all devices, both in download mode and instant play. The mobile version offers both the portrait mode and the landscape mode. Portrait mode is perfect for spinners who are always on the go and can afford to use only one hand while they play, and the landscape mode will allow you to look for the rewarding pandas with both hands. Of course, you can always explore the colourful bamboo forest from your desktops. Wacky Panda looks cute and it sounds great, but, when it comes to special features, it offers nothing special. A simple, old-school video slot with rich and colourful graphics and an Asian soundtrack is intended for players who do not prefer complicated Bonus features. Action junkies will not enjoy the 2017 release, that is certain. Even though world needs more pandas, the question is whether Wacky Panda will stand from the crowd, given the fact that there are more than enough slots with similar topic and gameplay. Of course, you can always try out the Microgaming title, at least for the kick of it. 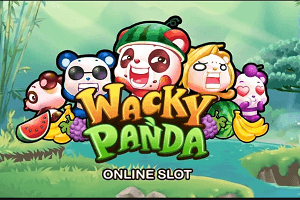 Play Wacky Panda slot at Casumo Casino!